The power output at the drawbar of a locomotive, the drawbar being the coupling between the locomotive and the train that it is hauling. Drawbar power used to be measured by attaching a “dynamometer car” between the locomotive and its train. A dynamometer car incorporates a number of measuring devices including a calibrated spring for measuring the tractive force from the locomotive and a odometer wheel for accurately measurement of distance covered, and a timing device from which speeds can be calculated. In addition, the dynamometer car would house mechanical plotting devices and a team of people to monitor them. Nowadays an electronic load-cell can be fitted between the locomotive and its train and GPS used for measuring speed and distance, with data being logged and power outputs calculated on a laptop computer. Drawbar power is the Indicated Power minus the mechanical losses in the locomotive’s motion and the rolling losses (including the wind losses) of the locomotive and its tender (see Resistance page). In the case of the 5AT, its drawbar power is diminished by the fitting of a large (80 tonne) tender. Because the rolling losses (and especially the wind losses) increase with speed, a locomotive’s drawbar power tends to peak at a lower speed than the Indicated Power. Equivalent drawbar power = drawbar power at constant speed on level tangent track. It eliminates the factors of acceleration and gradient/curvature resistance on the locomotive itself, the power to overcome which would be available at the drawbar at constant speed on level tangent track. 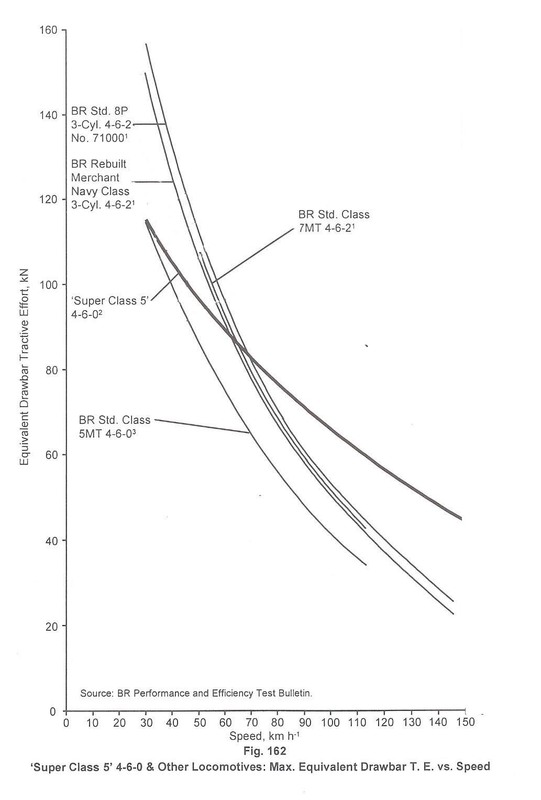 “Equivalent drawbar power vs. speed curves for various locomotives are shown below, copied from page 499 of David Wardale’s “The Red Devil and Other Tales from the Age of Steam” with the Tractive Effort curves removed for clarity.